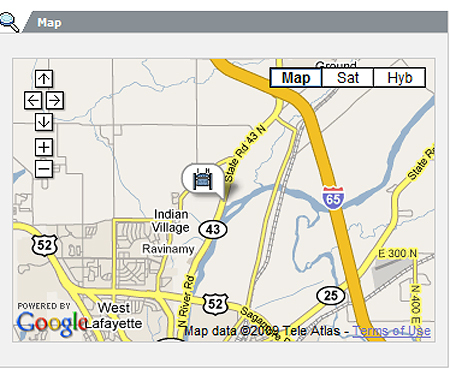 Battle of Tippecanoe on November 7, 1811.
directly across from the Indiana State Veterans Home. Tecumseh was born on Mad river, in Clark county, Ohio, 1768. He was the fourth of a family of seven children, consisting of six sons and one daughter. His father, Puckeshinwau, a chief of remarkable ability, lost his life in the battle of Kanawha, 1774. His mother, Methoataske, was also an Indian of exceptional mental power. His father was of the Kiscopoke, and his mother of the Turtle tribe of the Shawnee nation, and he, therefore, a full-blooded Indian. The education of Tecumseh devolved upon an elder brother, who sought to store his mind with a great love for the truth and contempt for wrong. He excelled all his fellows in the use of the bow and arrow, and in many waysexerted a great influence over the youth of his tribe. The first warlike movement in which Tecumseh participated was about the year 1783. It was an attack made upon some flatboats in the Ohio river, near Limestone. All the boatmen were killed except one, who was taken prisoner and burned to death. This terrible scene of human destruction so impressed Tecumseh's mind with the cruelty of this method of Indian warfare that he resolved never to burn a prisoner. It is believed that he always kept that resolution inviolate. While yet a young man, Tecumseh spent two years among the Cherokee nations of the South, returning home in 1790, shortly after the defeat of Harmar's expedition. From that time until the treaty of Greenville, 1795, he participated in many skirmishes with the whites, displaying remarkable coolness and good judgment in the command of his men. He led the Shawnee Indians in the battle near the rapids of the Maumee, August, 1794. Though the Indian forces were disastrously defeated by General Wayne in this engagement, Tecumseh's followers fought with great valor. It was in this fight that General Harrison and Tecumseh first met in battle. The valor and bravery displayed then by these heroes of the battlefield was indicative of their future military renown. Tecumseh refused to attend the meeting of chiefs who negotiated the treaty of Greenville, August 3, 1795, and always opposed the enforcement of its provisions. 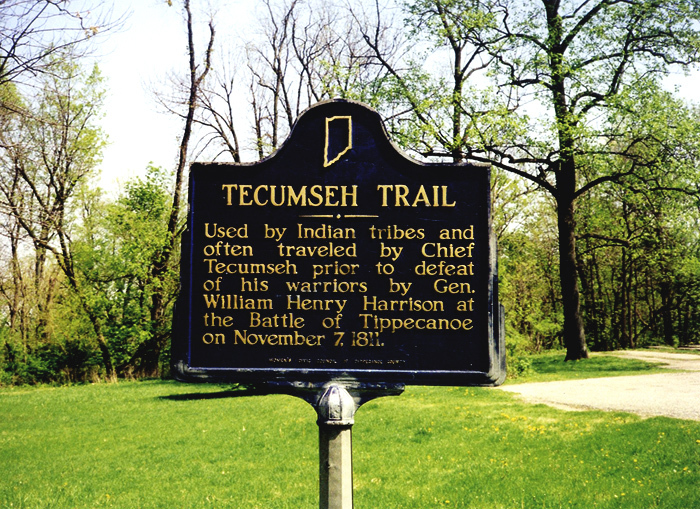 In the spring of 1797, Tecumseh changed his abode from Urbana and Piqua to the headquarters of White Water river. The following year he accepted an invitation to join the Delawares, who resided along the White river in Indiana. In 1805 Tecumseh and his followers joined some fragments of their tribe near the source of the Auglaize, Ohio. At a council in Greenville, held in 1807, Tecumseh expressed great dissatisfaction with the treaty of 1795. In the spring of 1808, the Kickapoos and Pottawatomies invited Tecumseh and The Prophet to locate in their country at the junction of the Tippecanoe and Wabash rivers. This invitation they accepted, and the Indiansjourneyed thither and built the town of Tippecanoe, commonly known as Prophet's Town. This place was of great importance, it being the abiding place of The Prophet and headquarters of the confederacy he and Tecumseh stroveto create. About this time Tecumseh's plan of forming a confederacy of the tribes of the Northwest, and attacking the white settlers, began to be apparent. The idea of a federation of the Indian tribes in a vain attempt to checkthe progressive strides of civilization to the west was not original with Tecumseh. It had been nurtured as thefavorite hope of Pontiac, Little Turtle and other leading spirits of the Indian race. Their object was theaccomplishment of one purpose -- to stay the advance and spread of white settlements. Tecumseh's plans werefar-reaching. He sought to build a vast Indian empire in the wilderness, with himself at its head. The Prophet and his superstitious religion were used as tools by Tecumseh. Although The Prophet appeared for some time thegreater, his popularity was made to serve the ambitious political purposes of his intellectual and sagacious brother,who promulgated a new political doctrine among the Indians. Tecumseh insisted that the Indians were one people, and claimed that no tribe could, without consent of others, make a valid transfer of lands. He journeyed from tribeto tribe for several years, laboring with Indians of all sections to secure their cooperation in his great work. Tecumseh was daring and far-seeing -- a sagacious and able orator, a remarkable military chief and a successful negotiator. He was an enthusiastic leader and very productive of expedient. There was an instinct of hatred for the white man in his heart, which he nurtured and cultivated. He had sworn eternal vengeance against the white race. Particularly qualified in that sort of tact which distinguishes the artful politician, he appealed with great suavity and success to the people, referred artfully to topics which awakened the spirit of vanity and pride and a desire for plunder. Although some of the more conservative chiefs, through policy, were reluctant to join him, and many of the old men objected to engaging in a contest that would stop their annuities and awaken the revenge of the United States, the young warriors eagerly listened to his schemes and were desirous of joining his confederacy. The thoughtless, the daring and the intemperate elements of the native towns rallied in support of his plans. Although artful, revengeful and full of cunning, Tecumseh possessed many noble traits. The Prophet had but little to commend him. He was crafty, haughty and unscrupulous. He was lazy and licentious, and under a variety of excuses extorted his maintenance from the Indians. A combination of circumstances gave him an ascendancy over the native tribes altogether disproportionate to his ability. He was an abler orator than Tecumseh, and it is said was the most graceful of all Indians, but he never spoke while in council with Tecumseh, so great was the sway Tecumseh held over him. The idea of ruling the Indians by a supposed mediator between them and God, in all probability had its origin in Tecumseh's fertile mind. This defeat caused the Indians to lose faith in The Prophet. The great majority of them returned to their tribes. The Prophet, for a time took refuge in a Wyandotte settlement on the Wild Cat creek; he then went to Canada and remained under British protection for some time. But he afterward returned to Ohio and settled with the Shawnee Indians, and with that tribe removed to the Indian lands west of the Mississippi, where he died in 1834, having been a pensioner of the British government since 1813. The battle of Tippecanoe was fought contrary to the orders of Tecumseh, who, when he returned from the South with his confederacy completed, found that all had been ruined by the folly of his brother. 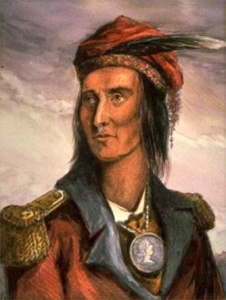 Tecumseh joined the British army in the War of 1812, and met his death in the battle of the Thames, October 5, 1813. It is said that the bullet which killed him was fired by Col. Richard M. Johnson, of Kentucky, who was afterward elected vice-president of the United States.